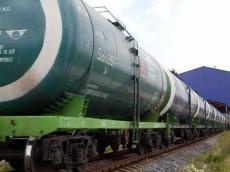 The temporary ban on import of gasoline by railway from Russia to Kazakhstan will come into force by August 10, 2018, the Kazakh media cited Deputy Energy Minister Bolat Akchulakov as saying Aug. 7. Akchulakov added that the introduction of a ban on the import of Russian gasoline is connected with overabundance of AI-92 gasoline in Kazakhstan after the completion of modernization of oil refineries. “Presently, the country has huge reserves of gasoline - more than 300,000 tons, which is almost a 30-day reserve of gasoline,” he said. Akchulakov added that the mechanism for introducing a ban on the import of gasoline is stipulated by a bilateral agreement between Kazakhstan and Russia within the Eurasian Economic Union. The ban is introduced temporarily for three months after which, depending on the situation on the market, it can be canceled or prolonged. At the same time, Astana does not intend to completely abandon the possibility of supply from Russia. There is a possibility of duty-free import of high-octane oil products.